This recipe for Curried Lentils is a spin off of the ever popular Quick Curried Chickpeas. It always amazes me how a recipe with so few ingredients can have such big flavor! For this version I subbed out chickpeas for lentils, added some diced carrot for color and sweetness (and because my New Year’s resolution is VEGETABLES! ), and increased the curry powder. The result, although not exactly pretty, was so good that I couldn’t stop piling forkfuls into my mouth while I took the photos. Seriously, I couldn’t stop. 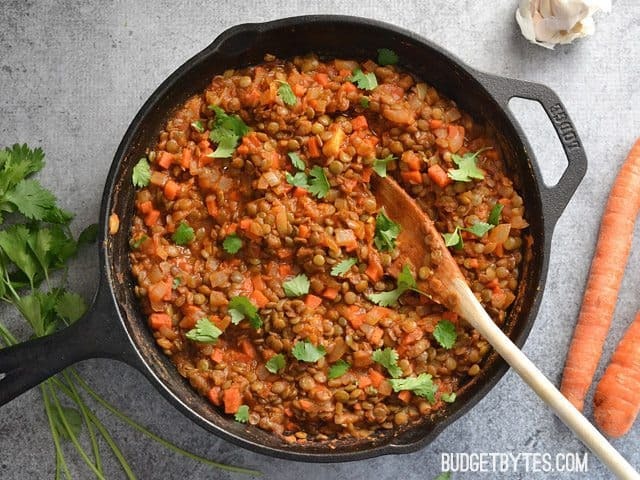 There are so many ways you can eat these Curried Lentils that I decided to present the recipe as the lentils them selves. They’d be great as part of a Indian platter with some creamed spinach and naan. 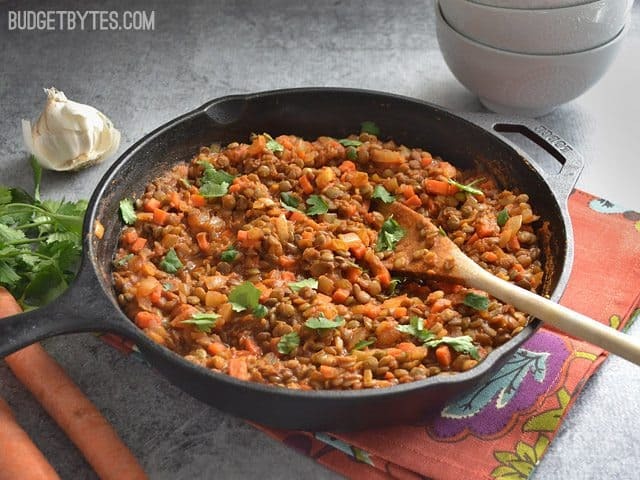 You could stuff them into a pita as sort of a sloppy joe-like sandwich (but vegetarian, of course), or you could build a “bowl” meal with brown rice, a fried egg, and maybe even some spinach. Options, options, options! This recipe made about four cups and depending on how you serve it, that should be at minimum four servings. Pretty stinking cheap. If you happen to have any left over, these lentils should freeze quite well. Ready in the blink of an eye, packed with flavor, and several different serving options. These Curried Lentils are a healthy go-to weeknight dinner. Spread the lentils out on a baking sheet to make them easier to see. Pick out any stones or debris. Bring 3 cups of water to a boil in a sauce pot, then add the lentils. Allow the pot to come back up to a boil, then turn the heat to low, place a lid on top, and simmer for 20 minutes, or until the lentils are tender. Drain the cooked lentils in a colander. Meanwhile, mince the garlic and finely dice the onion and carrots. 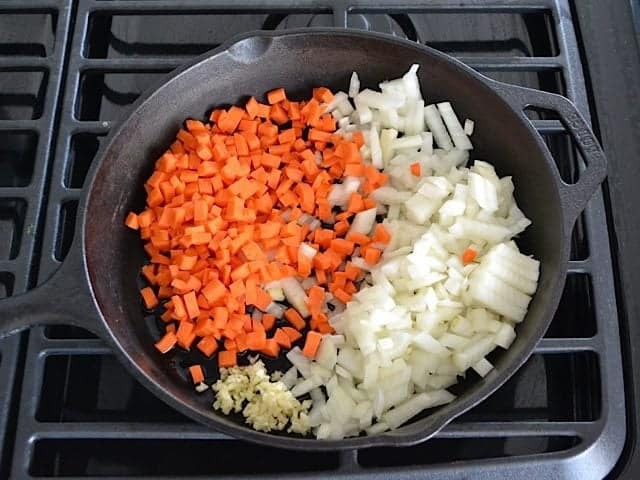 Sauté the onion, garlic, and carrots in a large skillet with olive oil over medium heat until the onions are transparent (about 5 minutes). Add the curry powder and sauté for one minute more. Add the cooked and drained lentils to the skillet, along with the tomato sauce. Stir and heat through (about 5 minutes). Turn the heat off, taste the lentils, and add salt if needed (I added about 1/2 tsp). Top with fresh cilantro and serve over a bed of rice, with naan, or crusty bread. *If you live outside the U.S. and "tomato sauce" is not available, the closest product would probably be strained or puréed tomatoes. 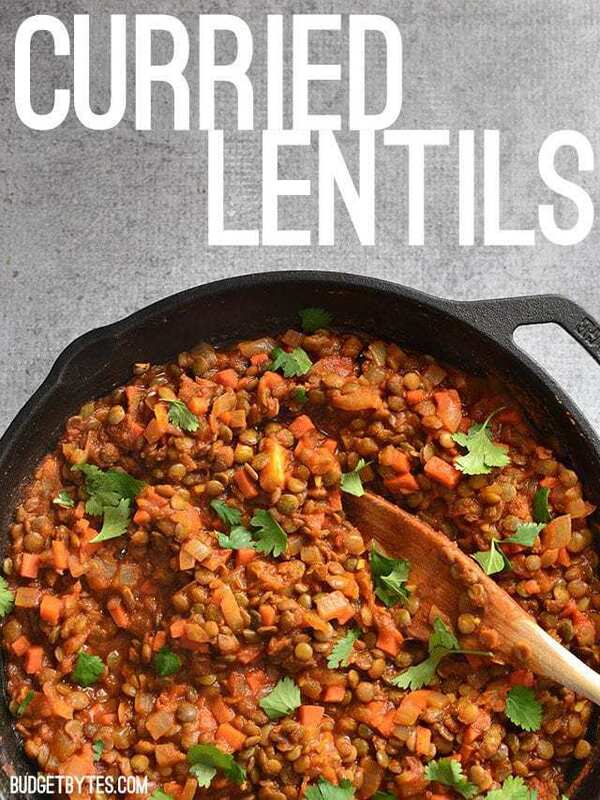 For this recipe I used brown lentils because they cook quickly and hold their shape. 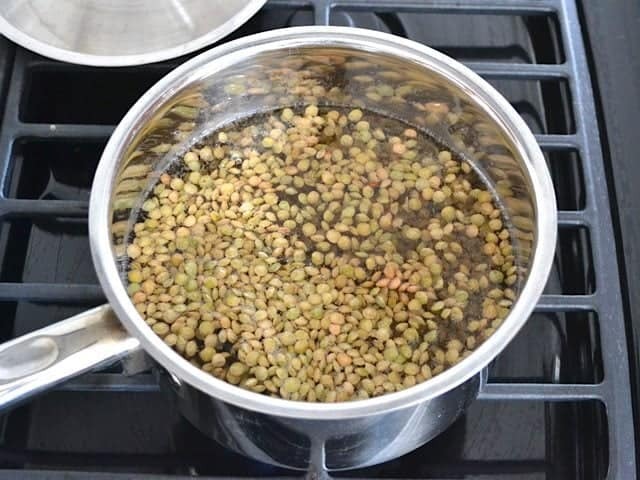 Brown lentils cook in about 20 minutes, whereas French or green lentils take closer to 45 minutes. 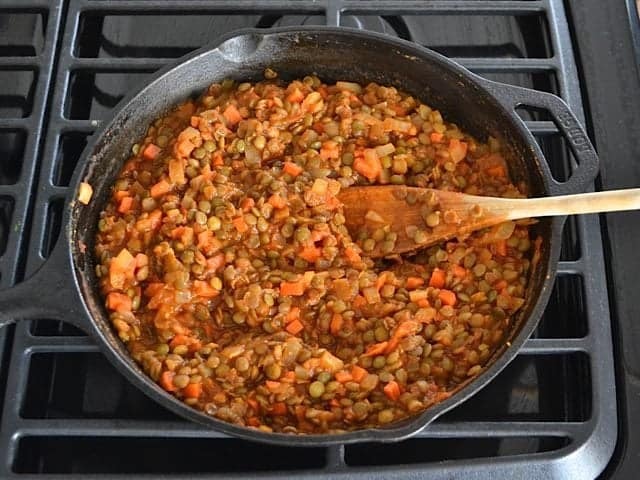 Red and yellow lentils also cook quickly, but they tend to break down and turn into mush when cooked. I definitely wanted the lentils to stay whole. 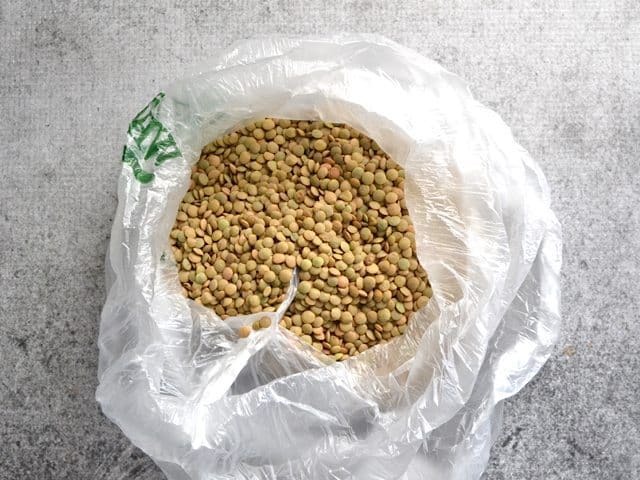 To cook the lentils, bring a pot with about 3 cups of water to a boil (the amount of water isn’t so crucial, just as long as there is enough for the lentils to move about freely, kind of like when cooking pasta. It will be drained off later). Once boiling, add 1 cup of dry lentils. Let the pot come back up to a boil, then turn the heat down to low, place a lid on top, and let it simmer for about 20 minutes. After 20 minutes, test a lentil to see if it’s tender. If not, let it simmer for about 5 more minutes. Drain the lentils in colander once finished cooking. Meanwhile, prep and cook the vegetables. 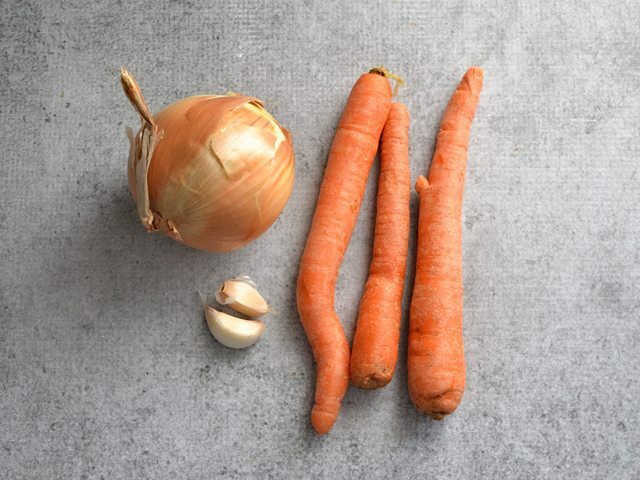 Mince two cloves of garlic and finely dice one medium onion and three medium carrots (about 1/2 lb.). 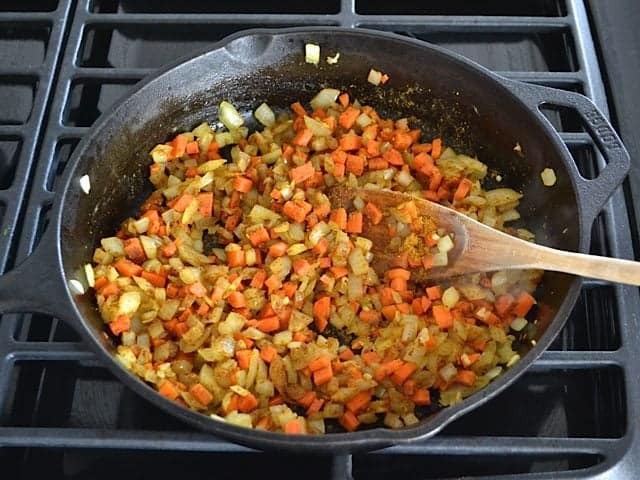 Add the garlic, onions, and carrots to a large skillet along with one tablespoon of olive oil. Sauté over medium heat until the onions become transparent, about 5 minutes. Add two tablespoons of curry powder and sauté for one minute more (this toasts the spices and helps bring out their flavor). All curry powders are a little different, so you can start with one tablespoon and increase it to your liking. Add the cooked and drained lentils, plus one 15oz. can of tomato sauce. Stir to combine and then heat through (about five minutes). Taste the lentils and add salt if needed. I added about 1/2 teaspoon. Serve them hot topped with fresh cilantro (if you’re a cilantro person). 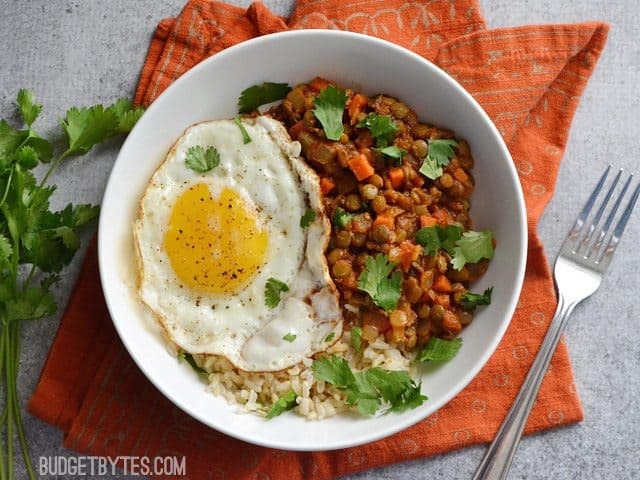 There are a lot of different ways you can eat these Curried Lentils, this yummy bowl being one of them. I added a bed of brown jasmine rice, the lentils, a fried egg, and some fresh cilantro. SO GOOD. I made this dish and because my doctor tells me to watch the salt, I left it out. Also, I bought tomato sauce without added salt. The result was bland. Then it occurred me to substitute lime juice for the salt, which made a huge difference. I simple added it to the cooked lentil dish. It was great and I will continue making it in the future. I was looking for a recipe to use some premade Trader Joe’s lentils… I didn’t have tomato sauce but used a can of diced and it is so delicious. I can imagine making this regularly for my lunch prep…it paired very well with some leftover quinoa. Yummy! So I’ve been trying to learn to work around recipes when I don’t have everything on hand so that I’m not running to the store every 5 minutes. I only had green lentils on hand, and didn’t have any carrots or tomato sauce. I ended up using ketchup + a little basil in place of of the tomato sauce and it’s AMAZING!! Put it on top of quick rice pilaf and it’s a winner. Will be on repeat, thanks so much! Sounds great-what kind if curry do you use? Unfortunately I don’t remember the brand name of the one I used here and I’ve moved since and can’t find it in the stores near my new home!